I’m referring to what many retirees are most afraid of: Running out of money before they die. An Allianz Life survey found that far more retirees are afraid of outliving their money than they are of dying—61% to 39%. This ever-present background fear is especially rearing its ugly head right now, given the bear market that too many came out of nowhere. Retirement planning projections made at the end of the third quarter, right as the stock market was registering its all-time highs, now need to be revised. Mark correctly used total return numbers in his calculations, however, while his data is correct the conclusion is not. While Mark is discussing the recovery of bear markets (getting back to even) it is based on a “buy and hold”investing approach. Not accounting for the current level of market valuations at the outset of the planning process. To explain the problems with both Mark’s assumptions, and the vast majority of financial plans spit out of computer programs today, let’s turn to some previous comments from Michael Kitces. “Given the impact of inflation, it’s problematic to start digging into retirement principal immediately at the start of retirement, given that inflation-adjusted spending needs could quadruple by the end of retirement (at a 5% inflation rate). 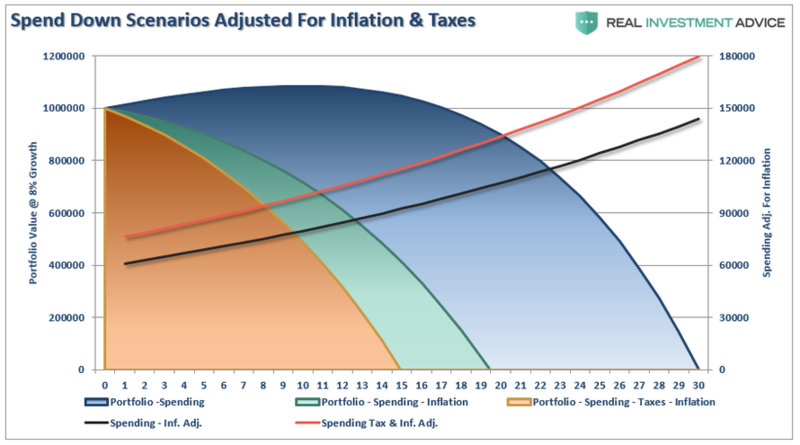 Accordingly, the reality is that to sustain a multi-decade retirement with rising spending needs due to inflation, it’s necessary to spend less than the growth/income in the early years, just to build enough of a cushion to handle the necessary higher withdrawals later! Michael’s assumptions on expanding inflationary pressures later in retirement is correct, however, they don’t take into account the issue of taxation. So, let’s adjust Kitces’ chart and include not only the impact of inflation-adjusted returns but also taxation. The chart below adjusts the 8% return structure for inflation at 3% and also adjusts the withdrawal rate up for taxation at 25%. By adjusting the annualized rate of return for the impact of inflation and taxes, the life expectancy of a portfolio grows considerably shorter. While inflation and taxes are indeed important to consider, those are not the biggest threat to retiree’s portfolios. There is a massive difference between 8% “average” rates of return and 8% “actual” returns. Currently, the S&P 500 (as of 1/18/19) is trading at 2,670 with Q4-2018 trailing reported earnings estimated to be $139.50. (S&P Data) This puts the 10-year average trailing P/E ratio of the S&P at a rather lofty 28.86x. We also know that forward returns from varying valuation levels are significantly varied depending on when you start your investing. As shown in the chart below, from current valuation levels, forward returns from the market have been much closer to 2% rather than 8%. As evidenced by the graph, as valuations rise future rates of annualized returns fall. This should not be a surprise as simple logic states that if you overpay today for an asset, future returns must, and will, be lower. But there’s a “whole lotta ifs” in that assumption. More importantly, if we assume that inflation remains stagnant at 2%, as the Fed hopes, this would mean a real rate of return of just 2.5%. This is far less than the 8-10% rates of return currently promised by the Wall Street community. It is also why starting valuations are critical for individuals to understand when planning for the accumulation phase of the investment life-cycle. Let’s take this a step further. 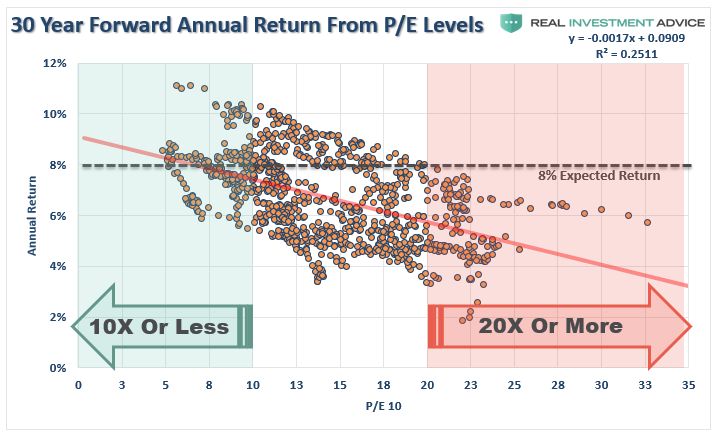 For the purpose of this article, we went back through history and pulled the 4-periods where trailing 10-year average valuations (Shiller’s CAPE) were either above 20x earnings or below 10x earnings. We then ran a $1000 investment going forward for 30-years on a total-return, inflation-adjusted, basis. 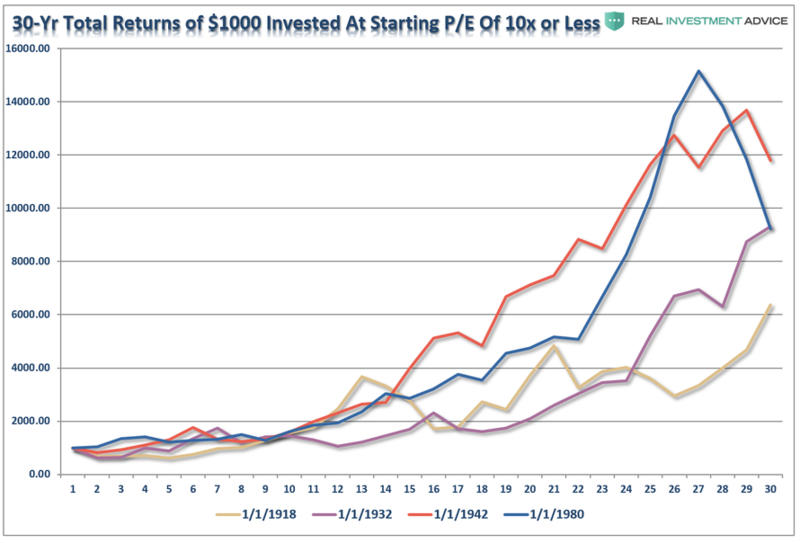 At 10x earnings, the worst performing period started in 1918 and only saw $1000 grow to a bit more than $6000. The best performing period was actually not the screaming bull market that started in 1980 because the last 10-years of that particular cycle caught the “dot.com” crash. It was the post-WWII bull market that ran from 1942 through 1972 that was the winner. Of course, the crash of 1974, just two years later, extracted a good bit of those returns. 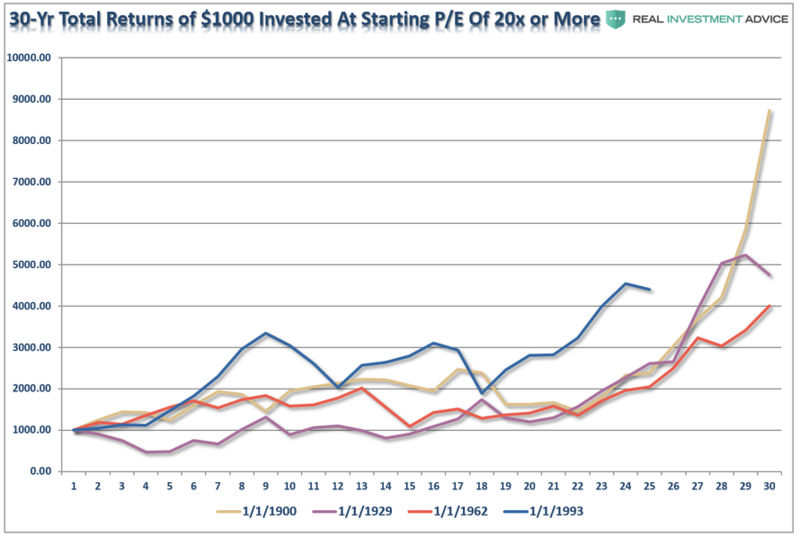 This idea becomes much clearer by showing the value of $1000 invested in the markets at both valuations BELOW 10x trailing earnings and ABOVE 20x. I have averaged each of the 4-periods above into a single total return, inflation-adjusted, index, Clearly, investing at 10x earnings yields substantially better results. 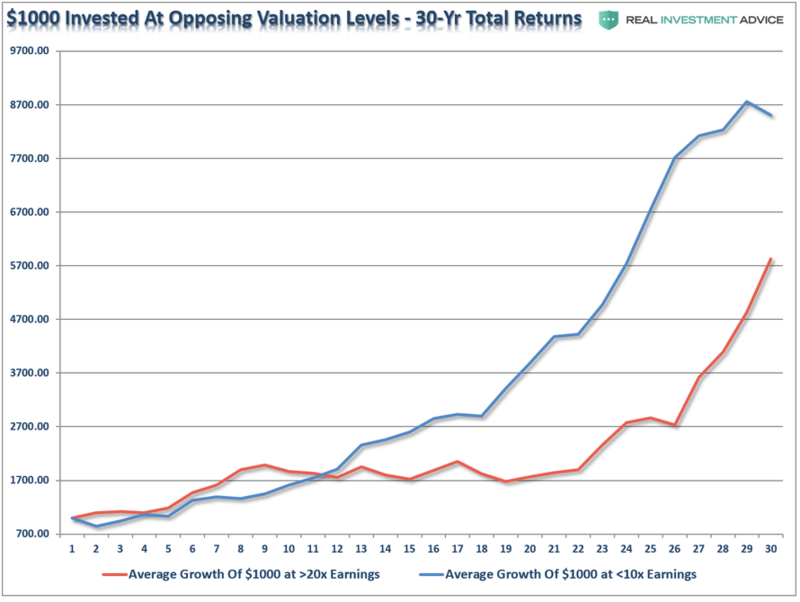 Not surprisingly, the starting level of valuations has the greatest impact on your future results. 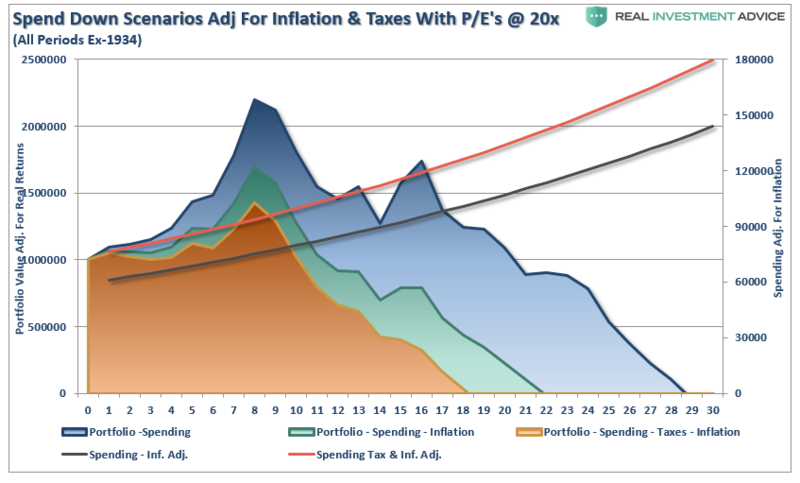 When we adjust the spend down structure for elevated starting valuation levels, and include inflation and taxation, a much different, and far less favorable, financial outcome emerges – the retiree runs out of money not in year 30, but in year 18. 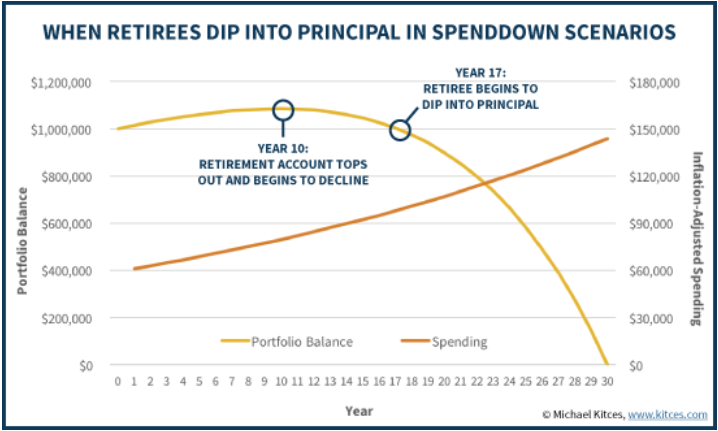 “And, if you’re retired and withdrawing from your portfolio, the ‘sequence-of-return’ risk – the problem of the early years of withdrawals coinciding with a declining portfolio – can upend your entire retirement. 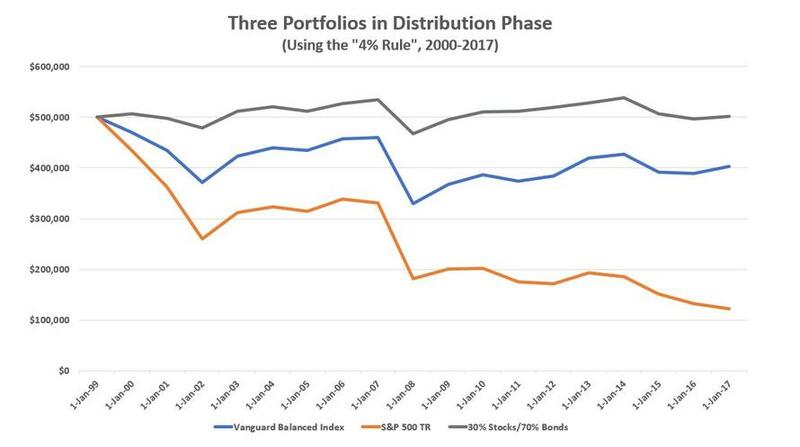 That’s because a portfolio in distribution that experiences severe declines at the beginning of the distribution phase, cannot recover when the stock market finally rebounds. Because of the distributions, there is less money in the portfolio to benefit from stock gains when they eventually materialize again. Importantly, what this analysis reveals, is that “retirees” SHOULD be worried about bear markets. Taking the correct view of your portfolio, and the risk being undertaken, is critical when entering the retirement and distribution phase of the portfolio life cycle. What are the expectations for future returns going forward given current valuation levels? Should the withdrawal rates be downwardly adjusted to account for potentially lower future returns? Given a decade long bull market, have adjustments been made for potentially front-loaded negative returns? Has the impact of taxation been carefully considered in the planned withdrawal rate? Have future inflation expectations been carefully considered? Have drawdowns from portfolios during declining market environments, which accelerates principal bleed, been considered? Have plans been made to harbor capital during up years to allow for reduced portfolio withdrawals during adverse market conditions? Has the yield chase over the last decade, and low interest rate environment, which has created an extremely risky environment for retirement income planning been carefully considered? What steps should be considered to reduce potential credit and duration risk in bond portfolios? Have expectations for compounded annual rates of returns been dismissed in lieu of a plan for variable rates of future returns? If the answer is “no” to the majority of these questions then feel free to contact one of the CFP’s in our office who take all of these issues into account. With debt levels rising globally, economic growth on the long-end of the cycle, interest rates rising, valuations high, and a potential risk of a recession, the uncertainty of retirement plans has risen markedly. This lends itself to the problem of individuals having to spend a bulk of their “retirement” continuing to work. Two previous bear markets have devastated the retirement plans of millions of individuals in the economy today which partly explains why a large number of jobs in the monthly BLS employment report go to individuals over the age of 55. So, not only should retirees worry about bear markets, they should worry about them a lot.